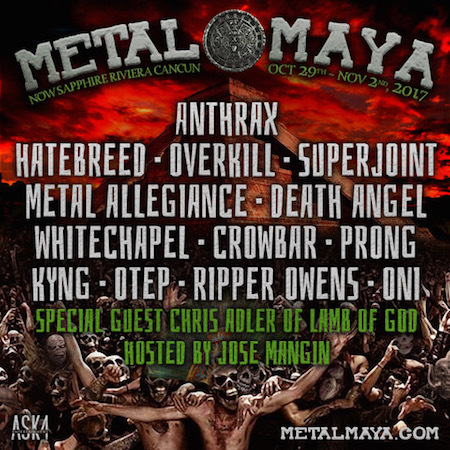 Hatebreed, Crowbar, Whitechapel, Prong, KYNG and ONI have been added to the music lineup for the first annual Metal Maya, a 4-day all-inclusive heavy metal destination festival vacation from October 29 - November 2 at the luxurious Now Sapphire Riviera Cancun, just south of Cancun in the paradise of Puerto Morelos on Mexico's Yucatan Peninsula. In addition, Lamb of God's Chris Adler joins Metal Maya as an event host. The overall Metal Maya music lineup is as follows: Anthrax, Hatebreed, Overkill, Superjoint (with Philip Anselmo), heavy metal all-star band Metal Allegiance, Death Angel, Whitechapel, Crowbar, Prong, KYNG, Otep, Tim "Ripper" Owens, and ONI. Alex Skolnick (Testament) and Kyle Sanders (Hellyeah) have been added to the Metal Allegiance band lineup, which already includes Phil Demmel (Machine Head), David Ellefson (Megadeth), Gary Holt (Slayer/Exodus), Mark Menghi, Mark Osegueda (Death Angel), Mike Portnoy (The Winery Dogs, Transatlantic, Flying Colors, The Neal Morse Band), Steve "Zetro" Souza (Exodus), Ryan Waste (Municipal Waste), and more special guests. Metal Maya will be hosted by SiriusXM's own Jose Mangin. "KYNG is honored to be a part of this festival, and share the stage with all of the gut-wrenching bands that have inspired us to play heavy music," says KYNG singer/guitarist Eddie Veliz. "To top it off, this will happen in our motherland! Can't wait for Metal Maya!" Metal Maya is the perfect place to celebrate Halloween—complete with bands trick or treating at your door—and Dia de los Muertos (Day Of The Dead), and will feature performances from over a dozen bands in a tropical paradise. Host Philip H. Anselmo will curate select cuts from his personal collection for a special Halloween Horror Movie night to drive a stake through the heart of Halloween! Metal Maya will also offer once-in-a-lifetime scenic excursions hosted by Metal Maya artists to complement your daily rock and relaxation schedule. From touring the scenic ancient caves of Rio Secreto, to jungle bound adventures and world-class snorkeling and fishing sites, the Riviera Maya is rich with the region's Mayan spirit and adventurous tropical surroundings. To add a little "Metal to the Maya," Metal Maya will provide guest hosts to accompany attendees on the excursions. Metal Maya excursions include ATV Riding with Metal Allegiance at Emotions Native Park, Deep Sea Fishing with Death Angel, and the Rio Secreto tour with KYNG, Otep and Jose Mangin. In other news, Keep The Beat Alive has teamed with Metal Maya to give away a grand prize trip for two to Metal Maya. Enter to win through June 15 at www.metalmaya.com/ktba. The Keep The Beat Alive grand prize winner will receive a suite for two adults at Metal Maya, two round trip economy airfares from within the continental United States, and ground transportation between Now Sapphire and Cancun Airport. Keep The Beat Alive is a non-profit dedicated to eliminating premature cardiac death in touring professionals. Through education, training and aggressive utilization of health care services, Keep The Beat Alive hopes to significantly cut the incidence of cardiac death. Visit www.KeepTheBeatAlive.org for more details. Metal Allegiance and Nuclear Blast are also offering a special promotion for Metal Maya attendees. Those who book a reservation at www.MetalMaya.com using promo code "METAL ALLEGIANCE" will be entered to win one of three prize packages: guitar autographed by Metal Allegiance and opportunity to attend part of a private rehearsal, private dinner with Metal Allegiance, or an ATV excursion with Metal Allegiance. Metal Maya guests will enjoy luxury accommodations, and tickets include gourmet meals, and all beverages (including alcohol). The all-inclusive heavy metal dest-fest vacation will feature bands performing on multiple stages in an intimate environment with only 1,000 guests, artist-hosted events, onsite activities, excursions and tours (available for additional fees), theme nights and more.